Ubiquitous connectivity will drive 26% annual revenue growth for vendors to help thwart malware and hacking threats. As embedded devices increasingly include connectivity as a standard feature, the Internet of Things is at risk of exposing the Insecurity of Things. Software vendors are offering a variety of security-specific solutions to protect embedded devices, including anti-malware technology, whitelisting/blacklisting, access control, data encryption, user authentication, and real-time threat analysis, as well as maintenance, support, and professional services. 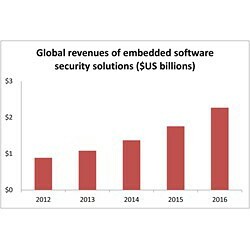 VDC Research forecasts that the global market for these embedded software security solutions will rise at a compound annual growth rate (CAGR) of 26% from 2012 to 2016. 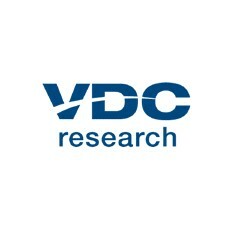 A new report from VDC details revenues, regional breakouts, vertical markets, and leading vendor share for this burgeoning market. Hackers and malware are finding tempting targets in connected devices across all vertical markets, from consumer electronics and automobiles to medical equipment and military hardware. These risks threaten to dampen the transformational potential of the Internet of Things, but security vendors such as McAfee (Intel Security), Symantec, and Trend Micro are rising to the occasion. “No individual solution can fully protect embedded devices from determined hackers using multiple attack vectors,” said Steve Hoffenberg, Director of M2M Embedded Software & Tools at VDC Research. He added that many startups and smaller vendors of embedded security solutions may be acquisition targets, as established players seek to expand their offerings and gain a competitive advantage. VDC’s Security & the Internet of Things Research Program – Learn About the Research Program.